Now that I've got the broader themes and concepts under wraps, it’s time to start working on details. First up, is the actual setting itself—where is this game going to take place? Is this going to be a real city, or one I made up? Where will the city be located? A lot of this comes down to whim, of course. Personally, I'm looking for a couple of different things. Since the past few games I've run of Vampire have taken place in relatively small cities, I wanted to branch out and try something bigger. I want this city to have a large number of Vampires, all interacting and messing with each other and not rely on “new players in town” to drive the story. I want to set it in America, to make things both easier on myself and my players—learning different terms and languages and pronunciations will, I fear, get in the way of the enjoyment of the game. Also, I doubt my own ability to do justice to the nuances and details of a foreign city. So, American it is. I also want an old city, and a decaying one. Since one of my themes is that vampires pretty much corrupt and destroy everything they touch, I want the city to reflect that, to be a shadow of its once vibrant self. Unfortunately, I also want to avoid any of the famous or iconic US cities—no New York, LA, or Chicago, for example. I headed over to Wikipedia and pulled up a list of the largest cities in the US. And I immediately run into a problem. See, Vampire recommends a rough ration of 1 vampire to every 100,000 humans in a city. Unless you’re talking about New York, LA, or Chicago, this makes for a very limited pool of vampires. There are fewer than 10 cities in the US with populations greater than 1 million, and a million will only get you 10 vampires. There’s a couple of “fixes” for this, both assuming that the 1:100,000 is more a national guideline, not a hard limit on a city. With the first one, you just double the number of people in your city. Or, you can use the “metro area” for the city to get a better number. Let’s say I was going to do Washington D.C. (I’m not, but I’ll use it as an example). D.C. officially has a population of about 600,000 people. That’s 6 vampires. If you double it to 1.2 million, you can get 12 vampires. However, if you look at the entire metro area for DC, you have about 5.5 million people, leaving you with 55 Vampires—now that’s a decent number. Of course, most don’t live in the city itself, but that’s where the majority of the social and political action goes down. Going down the list, I realize that none of the big cities really appeal to me. They’re either the famous big ones, or they are “new” cities, still growing and full of energy. Bah, who’d want to live in one of those? I thought a bit about creating my own city, but I am very lazy and like having access to online resources; names and maps and real clubs and the like, since otherwise I’ll end up with really, really boring names and a doodle sketched out on a piece of paper. I decide to split the difference, and take a real world city and horribly abuse it until it fits what I want. Since I want an large and old American city, I pretty much have to look to the East Coast. I’m not terribly interested in the North East, so I look further south. There are some very interesting cities in the South East, but I like coastal cities--because, really, how can you have a dark game and NOT include a docks? After poking around a bit, I decide on Charleston, S.C. It has a cool name, a neat geography, and loads of history. Now, I want to be clear, everything I read online indicates that Charleston S.C. is a charming small city, full of industry, culture, and history. It appears to be an ideal place to raise a family, or start a business. The kind of town where people in even the “sketchy” neighborhoods don’t think twice about leaving their doors unlocked, and is full of community and spirit. This is not the Charleston of my game. In my game, Charleston is a cancerous tumor rotting along the coast, a massive rough beast too exhausted by its own sin and corruption to do anything but lay there and rot. It was once one of the largest cities in America, but even the vampires couldn’t keep their herd trapped in such a hell for long, and it has seen its population drop precipitously over the years. While there are still massive factories processing oil, building ships and planes, there are many more abandoned and decaying. Vicious gangs fight for what few crumbs are left, while the elite huddle in their gated communities and golf courses, protected by armies of mercenaries. Population wise, I’ll say that Charleston had a peak population of roughly 2.5 million, but in its present incarnation contains just over 1 million (by comparison, the real Charleston has a population of 120,000 and is growing). Vampire wise, well, I’m not going to worry too much about the number of vampires just yet, but I will say that even at its peak, Charleston had a significantly larger population that it “should” have. With the sharp decline of the city, the vampires are faced with a dwindling herd, and their in-fighting has become all the more fierce and reactionary. 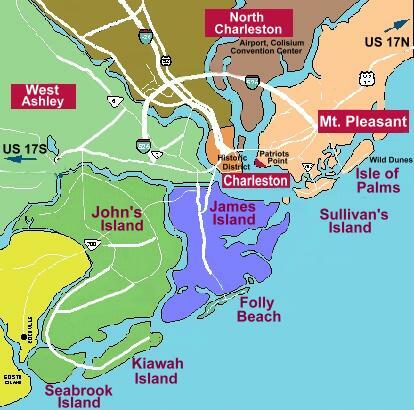 As you can see, Charleston is a city divided by various streams and rivers into a variety of peninsulas and islands. Just looking at this setup, I imagine an inherent conflict between the historic core and the outlying areas, a tension between unity and independence. Or, if not independence, then despotic neo-feudalism. I imagine that this is the most apparent ongoing struggle in the War of Ages, the powerful Elders who want their own personal playgrounds with a weak prince, and an urban core seeking to impose their will on the Elders. The young are often both the pawns and the deciding factor in these struggles, as princes come and go and the relationship between the kindred shifts. Jokes on you, vampires of Charleston! How are you going to cross all that running water? My first idea (before I read further down and saw you already had a choice) was to use one of our great fictional cities: Metropolis, Opal, and especially Gotham. There's enough comic-book nerdery out there to define Gotham as solidly as any real city. http://images1.wikia.nocookie.net/__cb20111221132219/batman/images/f/fc/Gotham_map.jpg , off the top of my head. This gives you full authorial control plus lots of reference material. And just to be clear, I'm not advocating DC Universe cities, but the WoD versions of these cities. What's Gotham city like with completely different bats?